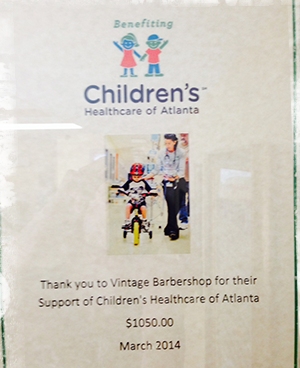 Vintage Barbershop is proud to support local Atlanta charities. Since opening our doors in March of 2012, we have helped to benefit the surrounding community by working with Children’s Healthcare of Atlanta in 2014, St. Jude Hospital in 2013 and Atlanta’s Ronald McDonald House charities in 2015. During our anniversary month every year, we collect donations at our shop and match whatever we raise. In 2013 we raised $500 for St. Jude Hospital. In 2014, we raised $1050 for Children’s Healthcare of Atlanta, and in 2015 we raised $600 for Atlanta’s Ronald McDonald House charities. Charity is a family tradition for us and we are strong believers in giving back to the community. 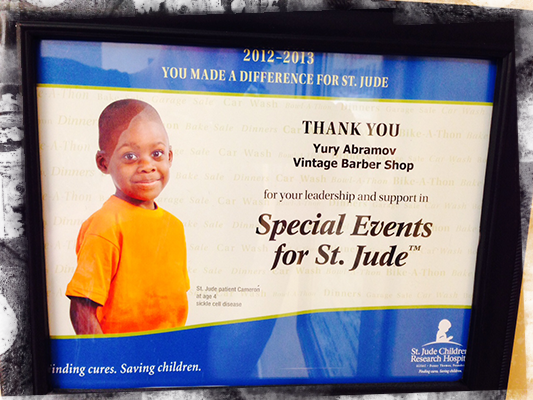 Please contact us if your charity is interested in partnering with Vintage Barbershop.